It’s time to think beyond those expensive Orlando theme park tickets. While three-figure passes at Disney World and Universal Resort are the norm, much of what surrounds them is designed for comfort and affordability. Family-focused hotels like Orlando World Center Marriott, Omni Orlando Resort at ChampionsGate, and Hilton Orlando are mainstays. They’re close to the parks, but have enough happening on-site — think sprawling swimming pools, fireworks, and laser light shows — to sway you away from daily park visits, and rates start at $99 per night. In February, the Grove Resort and Spa will open just 10 minutes from Walt Disney World with a focus on both design and affordability. One-bedroom suites start at $199. Farther removed from the parks, sophisticated hotels like the soon-to-debut boutique Delaney Hotel and the Grand Bohemian Hotel Orlando put you at the heart of local life. The city’s dining scene makes for happy wallets, too: in 2016, financial site WalletHub named Orlando the country’s top food city thanks to factors like the accessibility, affordability, and diversity of local cuisine. Greater Orlando has options ranging from Vietnamese and barbeque to restaurants by James Beard-nominated chefs and farm-to-table cuisine. Getting here is easy and affordable, too; we love that round-trip flights from major U.S. gateways can be nabbed for as little as $100. 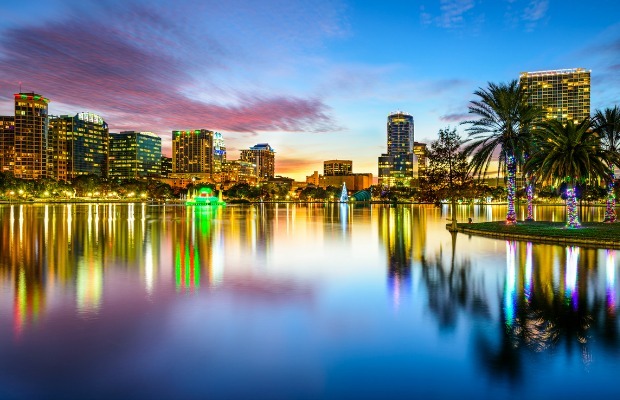 Plus, Orlando’s location in Central Florida makes it ideal as a home base for day trips to neighboring areas like Daytona Beach or St. Pete Beach.